The year’s blooms began late in February with the fragrant yellow, ribbon-like blooms of ‘Arnold’s Promise’ witch hazel, despite a few feet of snow that covered its base. 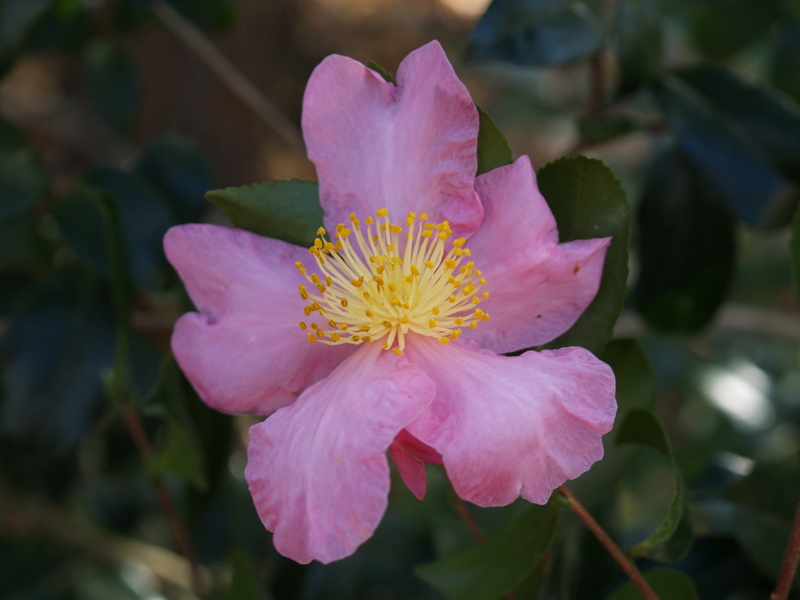 Nearing the year’s end in early December there are blooming camellias and mahonia, and a few scattered and battered flowers on the Knockout and Drift roses and Encore azaleas. 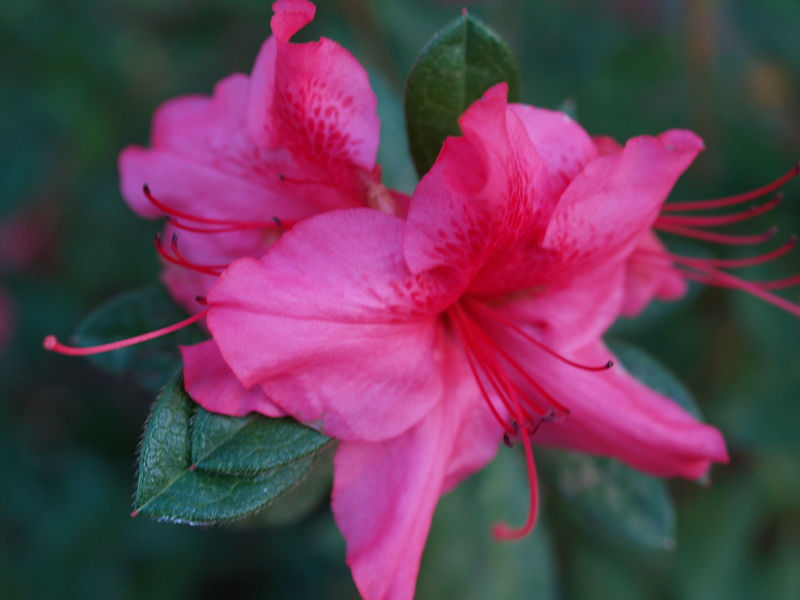 Recent overnight temperatures have regularly dipped below freezing, but the days have been moderate, so the Encore azaleas have continued to open an occasional contorted and freeze damaged bloom, by far the latest that I’ve seen in my garden. ‘Autumn Amethyst’ began flowering in September, and has bloomed continuously since the first frost at the start of November, but ‘Royalty’ and ‘Sundance’ have also opened a few flowers. Though the flowers will nearly cover the shrub in late April, the autumn blooms are less abundant, but spread over a month or longer. 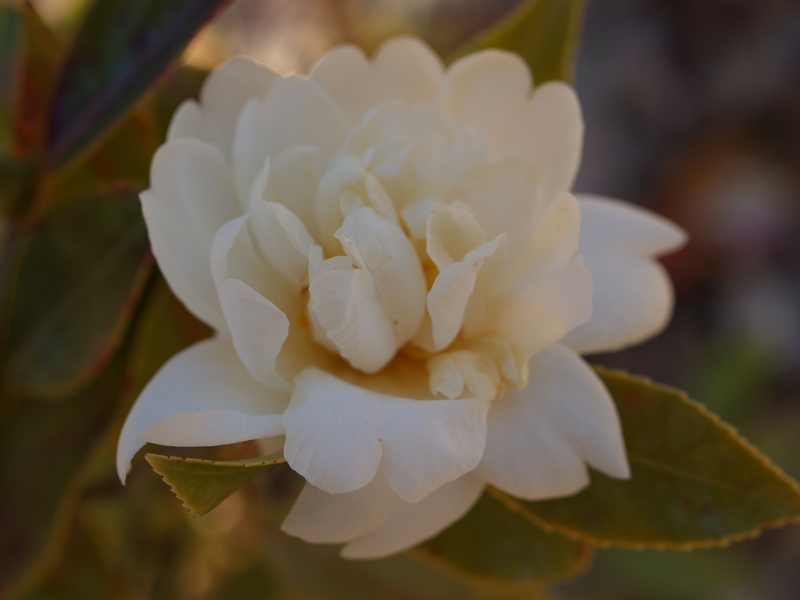 There are spring and autumn blooming camellias in the garden, but I prefer the late blooming hybrids that began to bloom in mid-November, and will continue for a few weeks longer. 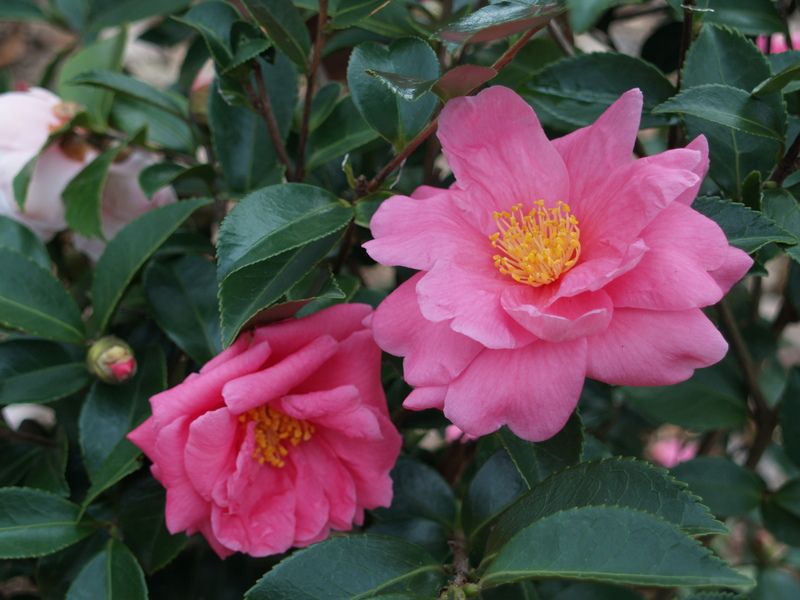 They have proven to be dependably winter hardy, though I have learned that all the camellias must be protected by a deer repellent or they will be quickly defoliated in January. The white semi-double flowering ‘Snow Flurry’ (above) and pink semi-double ‘Winter’s Joy’ (below) began to bloom the second week of November, and numerous buds assure that it will continue for a few weeks longer. Both are planted in somewhat deeper shade than they would likely prefer, which probably delays the flowers by a week. Snow Flurry is plagued by competition from a shallow rooted maple so that its foliage remains off color through the year, and I suppose that I’ll need to give it a shot of fertilizer in the spring to keep it happy. The blooms of ‘Winter’s Joy’ seem to open in a variety of odd configurations, with more petals or less, and there have been a stray off color bloom or two, but it has been more floriferous than the other autumn bloomers this season. ‘Winter’s Star’ (below) grows in a less shady spot, but is more open to cold autumn breezes, so one began to bloom a week later and the buds of the other in more shade are just beginning to open. ‘Winter’s Interlude’ is the latest of the autumn blooming camellias, and in some years will bloom intermittently from late December into January. With this late flowering it is susceptible to extreme weather, and in the past two years I have seen no blooms. In early December the buds have not begun to swell, and I expect that it will be several weeks before it will flower, if the weather cooperates. 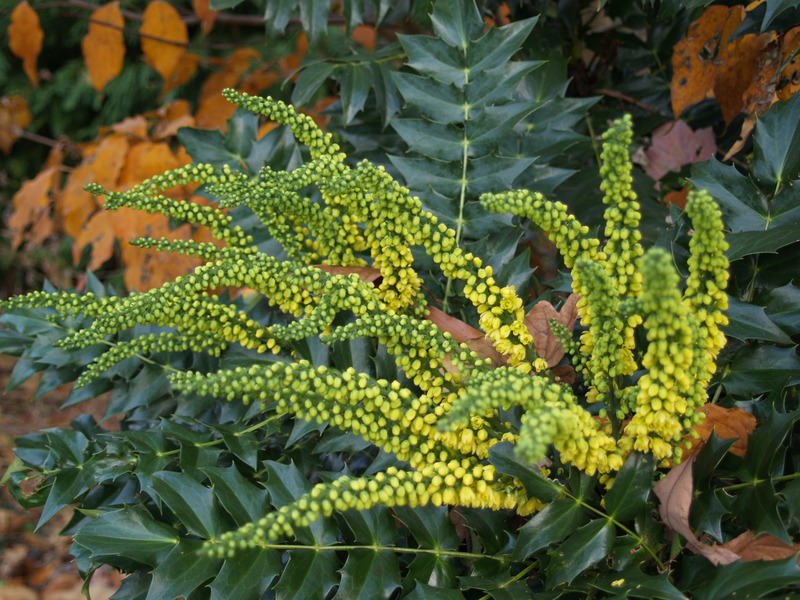 The first blooms of witch hazel in February are a bright, cheery yellow, and the last flowers of the year from ‘Winter Sun’ mahonia (Mahonia x media ‘Winter Sun’, below) are quite similar in color. The spikes of small yellow blooms arch from the branch tips, beginning to bloom early in November and often persisting into early January, unbothered by severe weather. The blooms are followed in late winter by small, grape-like fruits which are quickly consumed by birds when ripe. SITTING HERE IN FREEZING COLD WEATHER IN GA., I’M A MARYLAND TRANSPLANT. STILL FOLLOWING YOUR WEBSITE AND ENJOYING YOUR COMMENTS AND PICTURES. WRITING DOWN SOME OF THE CUTE PLANTS NAMES. PLANTING IN THIS AREA IS DIFFERENT BUT I CAN STILL USE YOUR SUGGESTIONS IN GA. TOO. LIKED INFO. ON DEER, THEY HAVE BEEN PESTY HERE ALSO. THANKS FOR INFO ON HOW TO DISCOURAGE THEM. GOOD LUCK WITH YOUR UPCOMING SNOW FALL. THANKS FOR A FUN SITE.